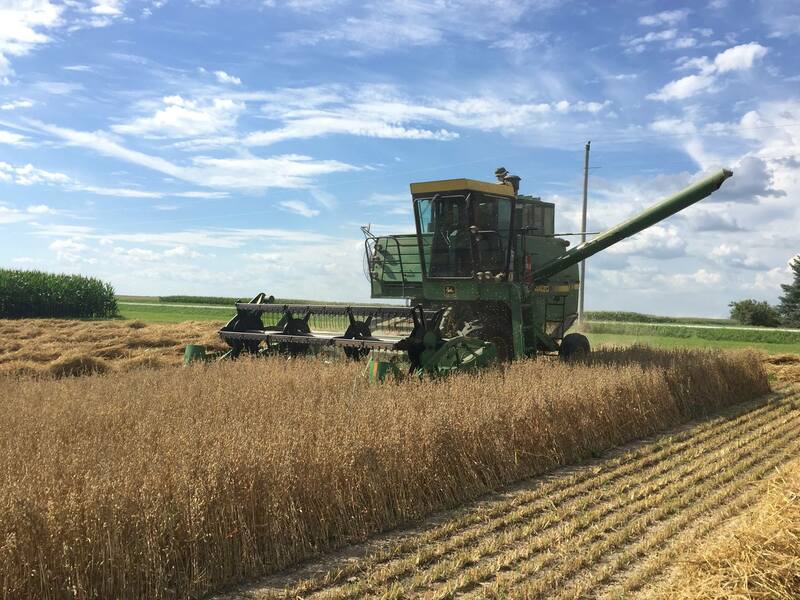 Proper variety selection and timely management are necessary to raise a profitable oat crop. 16 oat varieties were screened at three Iowa State University research farms and one commercial farm. Top yield performers differed at each location. 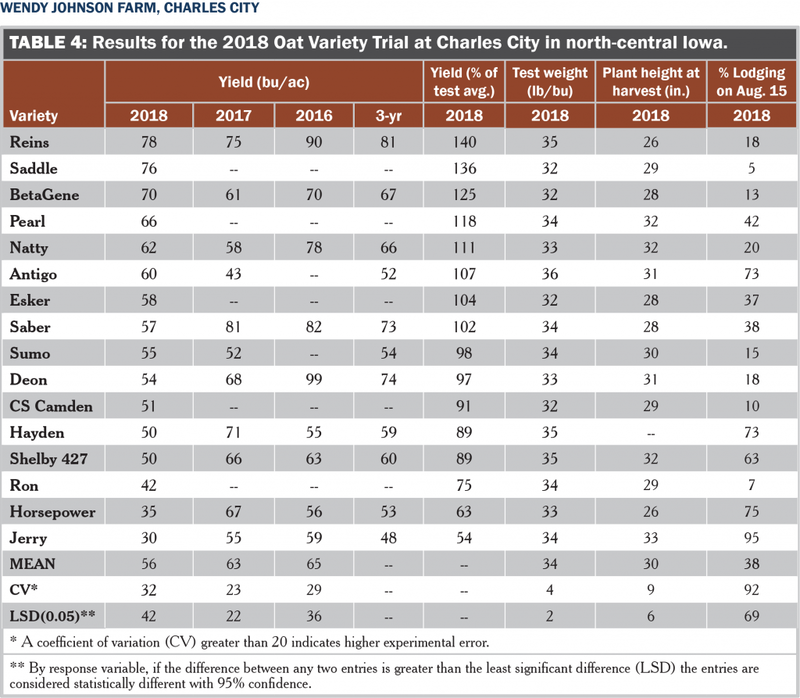 None of the varieties screened scored a test weight greater than 36 lb/bu in 2018. Oat harvest at the ISU Northeast Research Farm in Nashua. Planting oats before April 15 is recommended for optimal yields in Iowa. This helps avoid exposure to warmer weather during grain fill. Test weight is the most commonly used indicator of grain quality. High test-weight varieties should be chosen by growers who intend to market oat grain to food-grade buyers. Additionally, the concentration of Beta glucans in the grain, noteworthy for its positive effects on human health, is considered by food processors. Fat concentration is also considered for storage purposes with low concentrations reducing the potential for grain rancidity and increasing shelf life. Oat growth is regularly affected by rust and barley yellow dwarf virus. Variety resistance to these diseases should be considered. Another option is the use of a foliar fungicide applied at Feekes 9 growth stage, defined as flag leaf emerged with ligule visible. 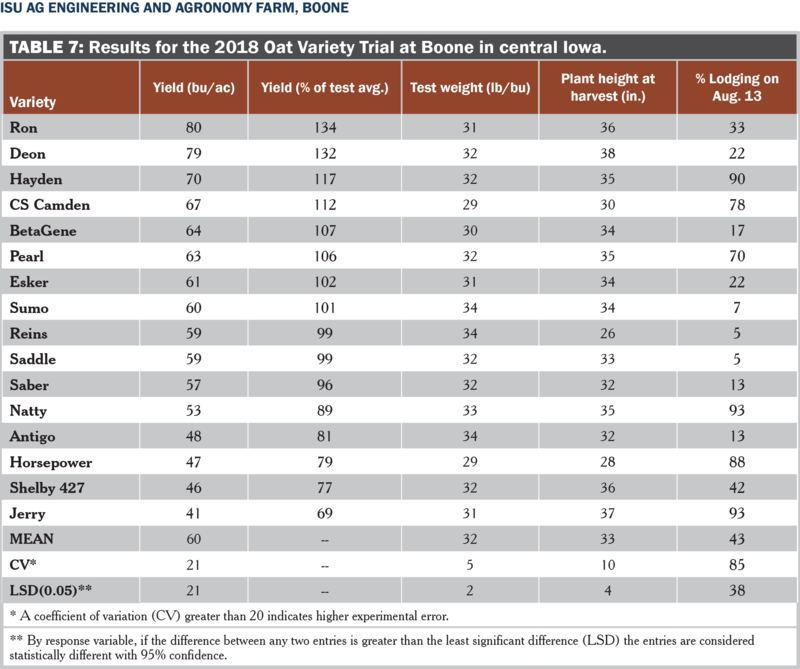 Variety trials were conducted at four locations in 2018: ISU Northern Research Farm in Kanawha; ISU Northeast Research Farm in Nashua; Wendy Johnson farm in Charles City; ISU Ag Engineering and Agronomy Farm in Boone. 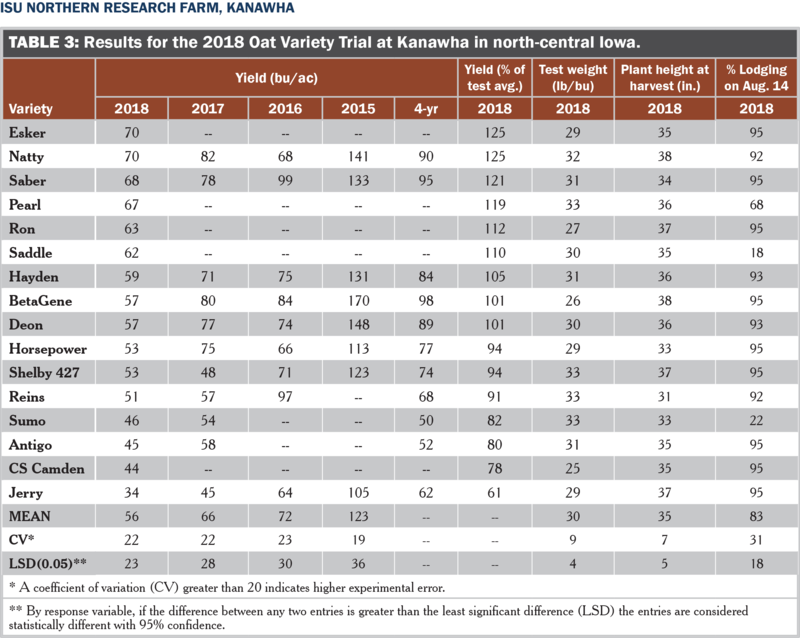 These trials build on the varieties screened previously at the Kanawha, Nashua and Charles City locations from 2015–2017 (Gailans et al., 2015; 2016; 2017). This was the first year the variety trial was conducted at the Boone location. 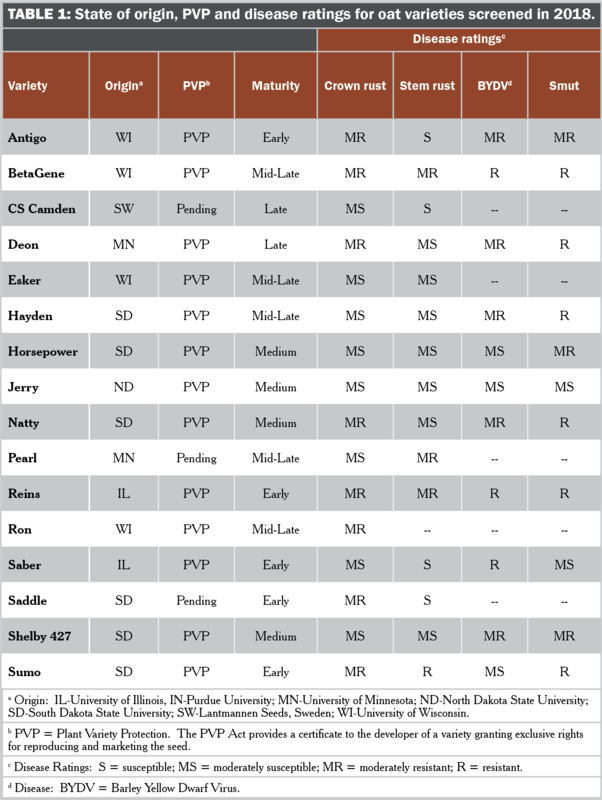 Information about each of the varieties included in the 2018 trials can be found in Table 1. At each location, oat varieties were seeded in small research plots (552.5 ft²) and replicated three times. The previous crop was soybeans at each location. A seeding rate of 128 lb/ac and row spacing of 7.5 inches was used. Seeding depth was 1 in. No fungicides, herbicides or insecticides were applied at any location. 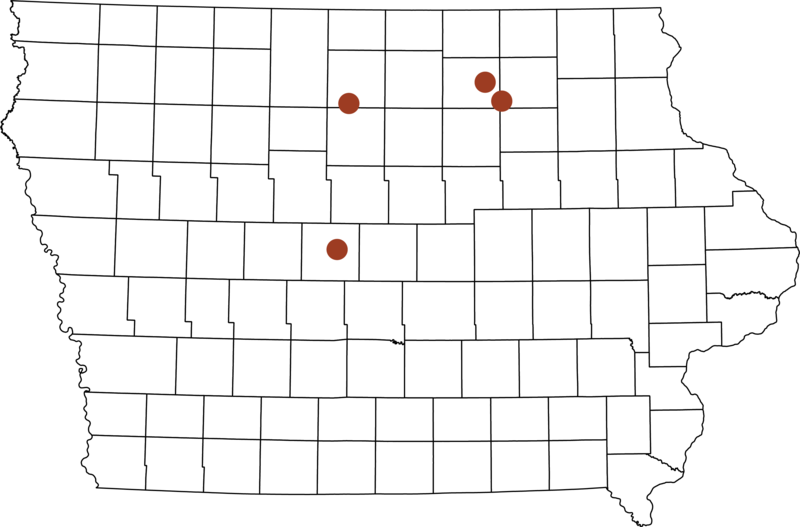 Entries were screened for crown rust, barley yellow dwarf virus and septoria leaf blight at vvlocations using a numeric scale (1=low, 9=high) by Bruce Roskens of Grain Millers, Inc. (St. Ansgar, Iowa) in late June at Nashua. Plots were harvested at Kanawha, Charles City and Boone with a Wintersteiger plot combine, cylinder speed at 1,450 RPM, concave set to 900 RPM and sieves moved to the high position; and at Nashua with a JD4420 combine with Weigh-Tronix load cells on weigh bin, cylinder speed at 1,200 RPM, fan speed set to low and concave set on position 1.0. Upon harvest, grain samples were analyzed with a Seedburo scale to determine test weight. Oat management information for each location is provided in Table 2. Data were analyzed using JMP Pro 13 (SAS Institute Inc., Cary, NC). Statistical significance is determined at P ≤ 0.05 level and means separations are reported using Tukey’s least significant difference (LSD). Mean monthly temperature and rainfall for the period Apr. 1 – Aug. 31, 2018, as well as the long-term averages, are provided for each location (Figure A1). April was cooler and drier than normal at all locations – these cool conditions precluded the target planting date of Apr. 15, which resulted in delayed planting at each location (Table 2). June and August saw over twice as much rainfall as the long-term average at all locations. Nashua received just over half the normal rainfall in July. Entries were analyzed by location and are listed in order of 2018 yield performance (Tables 3–5 and 7). Reported yields are corrected for 14% moisture. A “percentage of test average” calculation for 2018 is included to aid in comparing among entries at each location. 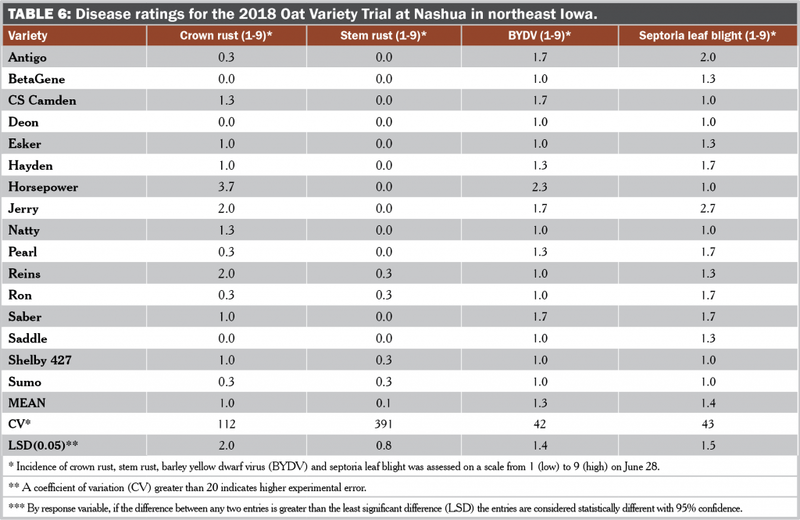 Yields were greatest at the Nashua site; the only site to receive fertilizer application (Table 2). Yield performance varied across locations. Esker and Natty were top performers at Kanawha; Reins was the top performer at Charles City; Deon, Hayden and Ron were top performers at Nashua; and Ron and Deon were top performers at Boone. No entries made a test weight of 38 lb/bu – the standard that many food companies require before dockage is applied. Reins was among the top test weight performers at all locations. Hayden and Antigo were among the top performers at two locations – Charles City and Nashua. Reins plants were the shortest at each location. Ratings conducted at the Nashua location on June 28 indicated low disease pressure in 2018 (Table 6). Selling oats into a specialty market (i.e., for human consumption) takes an increased level of management and care for the final product. Oat millers typically require a test weight of 38 lb/bu before dockage is applied. None of the varieties screened met this requirement at any location in 2018. 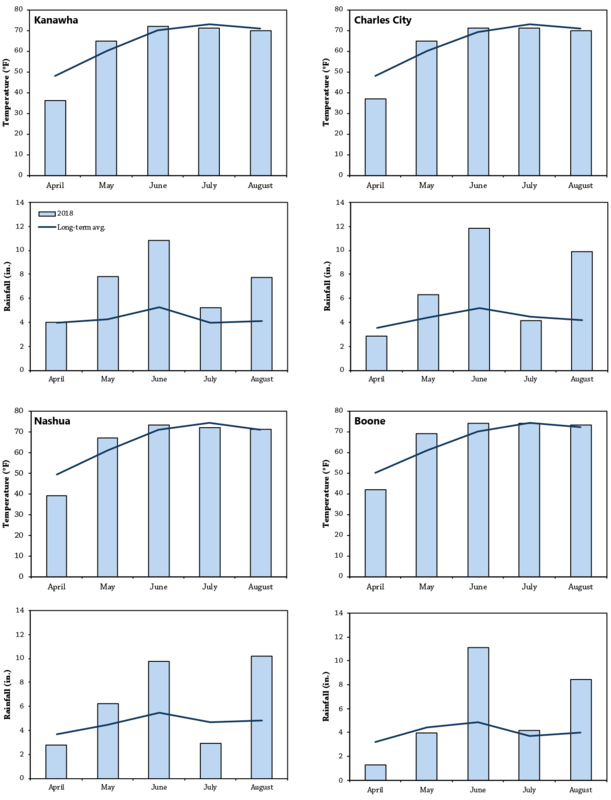 Delayed planting (late April) due to colder than average temperatures in April at each location could be to blame for the poor test weight performance. Reins, Antigo and Sumo have met the test weight requirement in previous years (Gailans et al., 2016; 2017). Farmers could consider using a grain vacuum to clean harvested oats – a common recommendation to increase the test weight of, and thus add value to, the final product leaving the farm. Gailans, S., S. Carlson, K. Pecinovsky and B. Lang. 2015. Oat variety and fungicide trials. Practical Farmers of Iowa Cooperators’ Program. Ames, IA. http://practicalfarmers.org/farmer-knowledge/research-reports/2015/oat-variety-and-fungicide-trials/ (accessed Jan. 17, 2019). Gailans, S., S. Carlson, M. Schnabel, K. Pecinovsky, B. Lang, and W. Johnson. 2016. Oat variety trials 2016. Practical Farmers of Iowa Cooperators’ Program. Ames, IA. 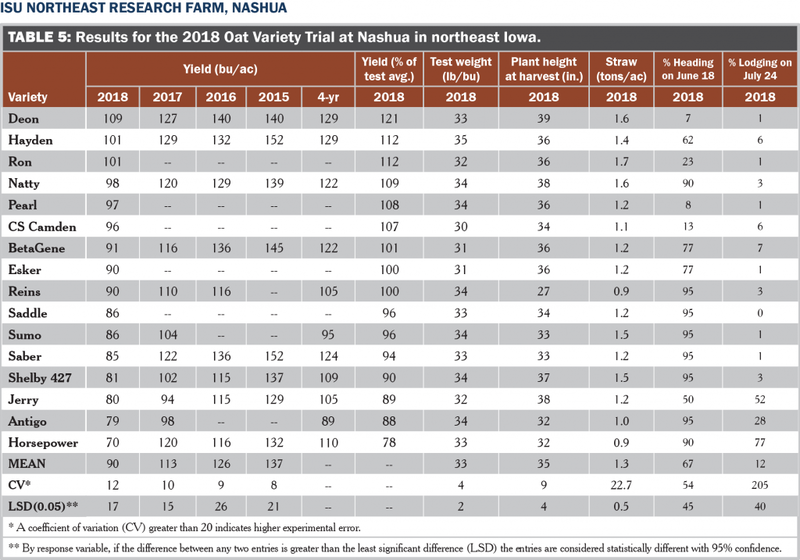 http://practicalfarmers.org/farmer-knowledge/research-reports/2016/oat-variety-trials-2016/ (accessed Jan. 17, 2019). Gailans, S., S. Carlson, M. Schnabel, K. Pecinovsky, B. Lang, and W. Koehler. 2017. Oat variety and fungicide trials 2017. Practical Farmers of Iowa Cooperators’ Program. Ames, IA. https://practicalfarmers.org/research/oat-variety-and-fungicide-trials-2017/ (accessed Jan. 17, 2019). Iowa Environmental Mesonet. 2019. Climodat Reports. Iowa State University, Ames, IA. http://mesonet.agron.iastate.edu/climodat/ (accessed Jan. 17, 2019).